It’s apparent that SP still enjoyed a considerable citrus traffic at Covina. In the distance, about 10-15 cars ahead of the engine, on the north side of the track can be seen the standpipe use for watering steam locomotives. 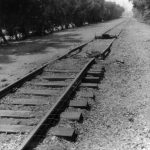 Covina lay at the bottom of a grade that extended to San Dimas and La Verne and PE issued special instructions to address operations using retaining valves as well as maximum speed. hat to appear dumb–but, what is a retaining valve and how would it have been used? Retaining valves are manually positioned to retain a pre-determined amount of air pressure in the brake cylinder while the control valve on each car is recharging the auxiliary reservoir in preparation for a re-application of the train brakes. 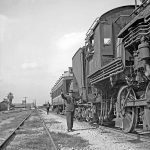 They are very useful in descending grade territory and before the advent modern day dynamic braking were essential for the safe operation of trains. That’s the short version. 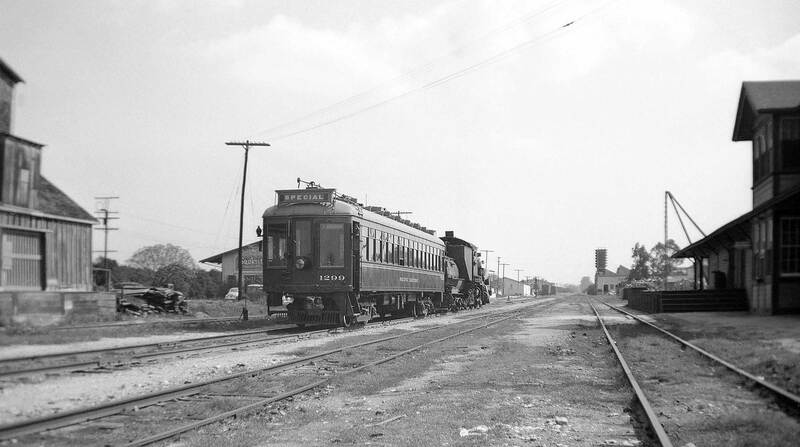 This is about where today’s Metrolink Covina station is now (on the north side of the tracks). My older daughter used to board the Metrolink train to LA here, but now she commutes with electric power on the Gold Line from Azusa. Are we seeing a pool of standing water in front of the station? Might that be a clue as to the time of year in Southern California? Or am I asking too many irrelevant questions like Pee Wee Herman…”What does it mean? I don’t know!”.